PT Krakatau Steel (Persero) Tbk - PTKS (IDX:KRAS) or referred to as "Krakatau Steel Group" is a reputable public-listed integrated steel company in Indonesia which is majority owned by the Government of Indonesia. Currently, the Government of Indonesia controls 80% shares in this company. Other 20% remaining shares was owned by public. Based in Cilegon Banten, Krakatau Steel Group operates primarily as a producer of steel products, include Hot Rolled Coil/Plate, Cold Rolled Coil/Sheet, and Wire Rod. 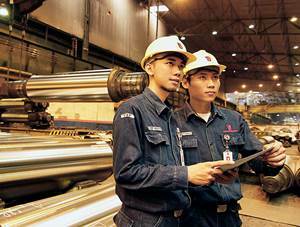 Krakatau Steel Group also engaged in trading activities, services, and other supporting activites. Krakatau Steel Group now has 6 production plants with installed total production capacity of 3.15 million tonns per year. The Company also supported by 11 key subsidiaries. In 2015, the performance of PT Krakatau Steel (Persero) Tbk is showing good results. According to PT Krakatau Steel (Persero) Tbk Annual Report 2015 as cited by JobsCDC.com, Krakatau Steel group booked total comprehensive profit of US$ 902,171 thousand in 2015, compared to net loss of US$ 160,304 thousand in 2014. Maximum age of 22 years old on 1 December 2016. Passed the National Examination with an average value of a diploma of at least 7.0. Well-behaved (SKCK required at the interview). Physical and Spiritual Health (Stages of medical tests by the Recruitment Committee). Job Seeker Card of Manpower Department (Yellow Card required at the interview). JobsCDC.com now available on android device. Download now on Google Play here. Please be aware of recruitment fraud. The entire stage of this selection process is free of charge. PT Krakatau Steel (Persero) Tbk - Fresh Graduate Operator PTKS December 2016 will never ask for fees or upfront payments for any purposes during the recruitment process such as transportation and accommodation.